I’d heard about Leigh’s new book, of course, but through all my research (I did that extensively, believe me) there was a lot of anonymity about the book, leaving me little to no storyline expectations from the book- except for the hope of a great new story and the hesitation to get into a new trilogy, for fear of emotional strain. And will the billions of other books releasing this fall, this wasn’t exactly on the top of my to-buy pile- but now, I see how COMPLETELY wrong I was. If you’re considering this book, let me tell you- it is BRILLIANT, Leigh Bardugo is a genius, and you will be transported in a matter of a few sentences, back to the world of the Shadow and Bone trilogy, except from a completely different point of view. 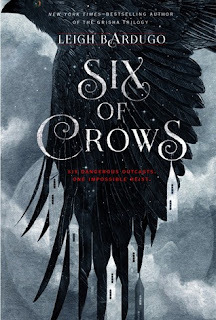 In Six of Crows, the Ravkan Civil War is over, and the Grisha (yes, the GRISHA!) are still reeling from it, but we see it all not from the royalty’s perspective, but from thieves and low-lives and we see the whole world in a completely different perspective. Kaz Brekker is a criminal prodigy. Kaz Brekker is calculating, cold and ruthless. Kaz Brekker has been offered all the money he could ever hope for, in exchange for a prisoner. Simple, right? The prisoner is a notorious doctor who has created a drug that in the wrong hands, could be deadly. So what, isn’t this normal? Except this drug- Jurda Parem- is designed especially for Grisha. And it makes them unstoppable. It can make Healers convince bend rooms full of people to their will. It can make Heartrenders stop unlimited hearts at whatever distance. If it falls into the wrong hands, the drug can mean the end of Grisha freedom as we know it. To free the scientist, and ultimately hand him over to the merchant lords of Ketterdam (you know, where Alina and Mal ran off to in the end of Shadow and Bone) Kaz Brekker needs a team- a team as deadly, as cunning and as ruthless as he is. He needs a team of criminals that have nothing to lost and everything to gain, to break into the most impenetrable fortress known to their world. If captured, death will be a blessing to them. If they succeed, they earn their freedom- and money, of course! I absolutely LOVED Six of Crows. Reading it was like getting sucked into this whirlpool of emotions and that feeling of falling hopelessly in love with a whole new host of characters, however unredeemable they might be- and loving every second of it! It was a perfect novel- as perfect as young adult gets- with Leigh Bargudo producing her best work to date. If you’re hesitant- like me- or simply haven’t hear of this book- I can only say READ IT! It will blow your mind! God, I'll be so glad when I get this from my library! I'm next in line. Great review! Thanks Lekeisha! I hope you get on it soon- Let me know how it goes:) As you can see from my excessive use of the UpperCase- It truly was brilliant! And the positive reviews just keep coming! What a fantastic review for what I'm hoping and predicting is an absolute fanatastic novel! I am so excited to read this one! !